Josh Eichorn: Patiently waiting under the mistletoe with a cold sore on his lip the size of a canned ham. A few days have passed since Dragon escaped from Atlantis and he comes across an orchid where he helps himself to some fruit. He is startled when a group of men and women known as the Bug-Riders drop down out of the sky on their grasshopper steeds. Their leader is Guy Masters and he advises Dragon to move on as the owner of the orchid will not be pleased to have his fruit stolen. Dragon offers to pay for what he has taken but only has a few American dollars. It is revealed from this conversation that Dragon has found himself in Australia where they have cut themselves off from the USA. Guy offers to give this new arrival a lift into town and explains that the giant insects are a result of the Martian enlarging rays. They soon arrive at their destination where Dragon is alarmed to discover that there are gigantic insects and other creatures all inhabiting the same location as ordinary humans. These creatures are passive but it is unclear to Dragon just how they are being kept under control. Dragon is desperate to get back home and is given directions by Guy to a Professor Fitzroy who should be able to steer him in the right direction to the USA. They notice two young men fighting in the street which Dragon breaks up. Guy explains that they had merely been training for gladiatorial games which are the single best method of earning money in Australia. He then reveals how, in an effort to keep CyberFace out of the country, Australia’s premier has banned the use of anything electronic. Even items ran on a closed circuit or batterieshave been cut off by law. As he walks through the town, Dragon notes how Australia seems to be faring far better than his native Chicago and that if it was not for the giant insects, it would look relatively normal. He finally reaches the mission which Professor Fitzroy runs. Dragon gets his first hot meal in a while before asking those present about methods of getting back home. There is little help forthcoming as the population cannot understand why he would want to head back to that messed up country. Dragon finds himself a job working for a man named Leroy Peebles who owns a shipyard similar to the one he worked at prior to joining the Chicago Police Department. He spends the next few weeks working eighteen hour days in an effort to scrape together enough money to purchase a steamboat or other mode of transport. Business is not good for Leroy though and he is forced to let Dragon go, promising to pay him any remaining wages in a few days’ time. On his walk back to his cheap apartment, Dragon hears a scream for help and races to help, finding a pair of siblings getting harassed by the local police force. The brother had been stockpiling videotapes for when the power is turned back on. When one of the officers finds a radio in his possession, he carries out a summary execution and shoots the man in the head. Dragon leaps into action to avenge this death and protects the sister, taking her and the dead man’s body away to the coast. A short funeral service is held before Dragon offers to take the sister with him on his makeshift boat, built from scrap wood. The police arrive to try and make an effort, riding a swarm of killer bees and wielding powerful handguns. Dragon gets his companion to his boat and pushes it out to sea, hoping to catch up once he has dealt with the police. 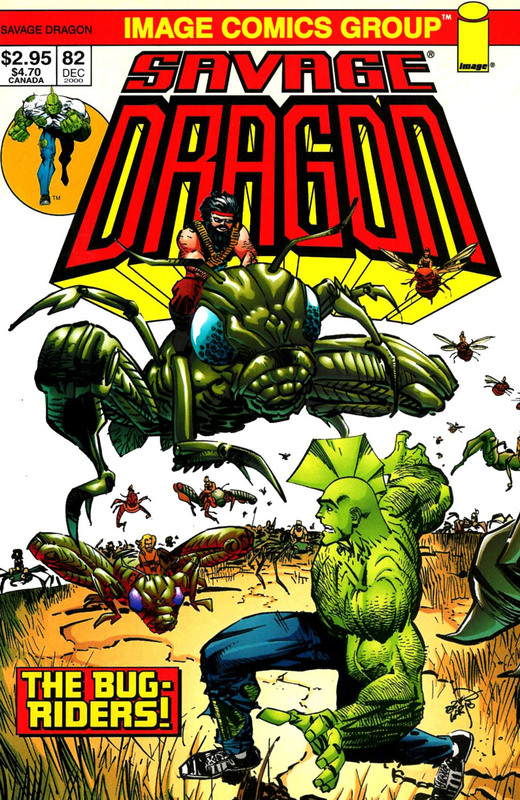 Guy Masters leads the Bug-Riders into action to cover the escape of Dragon who swims out after his boat.